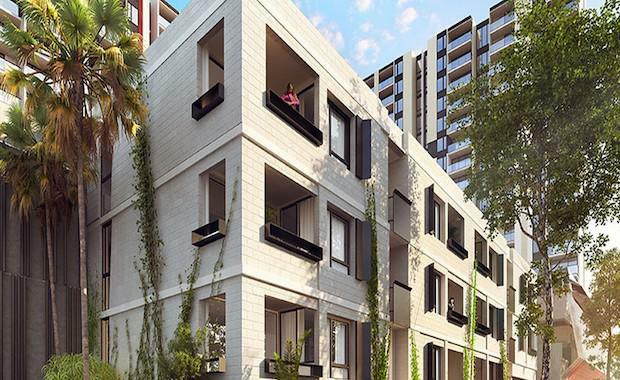 Lend Lease's latest residential offering, The Terraces, was released on Saturday 7 February and delivers a new street-level dimension to the Brisbane Showgrounds redevelopment. Lend Lease Brisbane Showgrounds Project Director, Andrew Hay said the redevelopment of the Showgrounds would activate the precinct year-round and key street-level features like The Terraces were an important part. "We've worked with our architects to create The Terraces that bring day-to-day proximity to the edgy retail outlets and bars, local and global foods, artisan providores and the vibrant arts community that is to come,” he said. The Terraces (part of The Yards development) is made up of 11 exclusive, one bedroom, one bathroom plus study boutique apartments. The Terraces are designed by award-winning architects, Hayball, and feature exposed matt black fixtures and fittings throughout the apartment alongside stone and polished concrete bench tops including a bespoke island kitchen bench. The exterior features cream brickwork laced with green vines growing vertically up the façade and landscaped footpath planter-boxes. Residents of The Terraces will have access to The Yards' facilities, including an outdoor pool, pool-side cinema, resident citrus and herb gardens and an alfresco kitchen. When complete, King Street will become a living history reflecting 139 years of heritage and will include a 1,200 square metre supermarket, up to 40 cafes, bars, street dining options and fresh food providers.